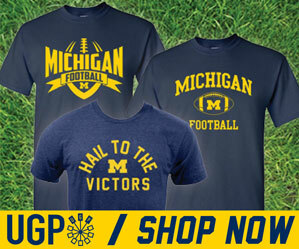 Normally, we only offer up Michigan blog views and opinions in these posts…but today we're loosening the rules a bit. This isn’t about winning and losing anymore. It isn’t about hot seats or upholding tradition. This is about the well-being of players, and whether they’re prepared to lead a life outside of football. Brady Hoke’s actions were indefensible, and we can no longer stand behind his employment at Michigan. It’s a shame Dave Brandon can, though. The idea that Hoke did not see Morris stumble, then grab a teammate to keep from crumpling to the ground, is inexplicable. Morris eventually had to be carted off the field. What did Hoke have to say about all of this? "I don't know if he had a concussion or not, I don't know that," Hoke said. "Shane's a pretty competitive, tough kid. And Shane wanted to be the quarterback, and so, believe me, if he didn't want to be he would've come to the sideline or stayed down." What? Is this really 2014? Brady Hoke and his sideline failed, completely and totally, Saturday when it left an obviously wounded football player on the field for far too long, and then inexplicably allowed him to return to the game minutes later. Asked why he decided to leave him in the game after he clearly didn't look well, Hoke said Morris was a "tough kid," and that "if he didn't want to be (in the game), he would have come to the sideline or stayed down." There's been plenty of debate recently over whether or not Hoke should keep his job based on how his team is performing on the field. But after Saturday, that question may have to be re-phrased, as we're now left to wonder whether or not he should keep his job based on his ability to protect his football players during the course of a game. So even as fans wondered how soon Morris would start, especially as Devin Gardner proved turnover prone and the Wolverines sunk under Hoke, inside the program that was never a reasonable option. Well, on Saturday, Shane Morris, now a sophomore, finally started for Michigan. It was the surest sign Brady Hoke is simply out of ideas because the project hasn’t progressed a bit, and Morris looked undeveloped, unprepared and surrounded by equally undeveloped and unprepared talent. "I think this team can still win the [Big Ten] championship," Hoke told reporters after the loss. "I really do." Delusions, or miracles, aside, this is over. Letting a player with a brain injury (and a likely ankle sprain to boot) back on the field is reprehensible, a fireable offense. Were it Rich Rodriguez and not Hoke in this position, the Detroit media would have excoriated him. At 2-3 with road trips Ohio State and Michigan State remaining, Brady Hoke's goose is cooked. The only question is if Dave Brandon goes down with him. Today I am not here to bash the Michigan program or make fun of them but what Brady Hoke and the medical staff did Saturday night was beyond the scope of looking out for a players safety and something needs to be done to Hoke. Yes if this were to happen at Ohio State I would be calling out Urban Meyer, Hoke failed his players. Have to wonder if recruits are rethinking their commitment to Michigan when it looks like the head coach doesn’t seem to be looking out for them. This program is broken. The coach is too dumb to be in charge of other people. The athletic director is so loathed that when the remainder of the student section started to chant something after the concussion fiasco, they went with "FIRE BRANDON." Tickets go for two cokes, and that's too expensive. Stephen Ross is defending Brandon, and I feel helpless. The thing I love most in the world has been held hostage by unacceptable people. Regardless of how you felt about the on-field performance, what Brady Hoke did in putting an almost certainly concussed Shane Morris back on the field was reprehensible and, if you believe the first job of a head coach is to protect his own players, worthy of a firing. The fact that Hoke let Morris stay on the field as long as he did in the first place—when Morris, at one point, waved at the sideline while needing a lineman's support to stand—was awful enough; to ask Morris to re-enter that game was beyond the pale. The new reality is that Michigan is in a dark place, darker than I have ever seen it. And nearly all of it is self-inflicted. And I'm not sure there's an obvious way out of it. Some seem confident that the right decisions are being made. But, being confident in having made the right decision is not the same as making the right decision. Go buy one of these. Keep it handy. We're going to need it a lot over the next few weeks. Because we're not going anywhere anytime soon. You pissed us off. Not because you are losing. But because you thought you could tell us everything's fine when we know it's not. So we're not going anywhere, no matter how high the tide gets. For three minutes, Brady Hoke stopped being a head football coach. Instead, he turned into an overwhelmed, prideful, selfish, incompetent man standing on Michigan’s sideline. His disregard for player safety, his inability to diagnose the situation, his lack of leadership for stepping in are nothing short of atrocious, not to mention dangerous. He completely lost control. In the middle of a game. For all the jokes fans and media make about him not wearing a headset or calling plays, the two aspects of the game Hoke actually is in charge of – clock management and player safety – failed miserably. I can clap my hands too. I think every coach hits a point where you say, "Yeah, this just isn't going to work out." For whatever reason, I think Rich Rodriguez's moment was "You Raise Me Up," even though his defenses sent up warning flags. This game may have been Hoke's moment. I'm not saying that I think he'll be fired on Monday (who would you promote to interim head coach? ), and I'm not saying that a 9-3 finish (hey, it's possible) couldn't save Hoke. But the handling of Gardner, the handling of Morris, and curling up into the fetal position at the end of game is a potentially lethal combination. If Doug Nussmeier or Jeff Hecklinski is the head coach sometime soon, I will not be surprised. WTF...where did my post go? Ok, again, it seems like most of these writers didnt even watch the play or plays beign discussed. When was Morris, ever "carted off the field"? He walked off the field under his own power....when was there a "helmet-to-helmet" hit? The hit that supposedly concussed Morris was a hit UNDER HIS CHIN! he rode off in a cart at the end of the game.